Long-time anti-salmon farming activist Alexandra Morton and the Namgis First Nation sued the DFO in September according to the cbc.ca. The Namgis First Nation resides in the Broughton Archipelago located near the Queen Charlotte Strait on the west coast of British Columbia (BC). 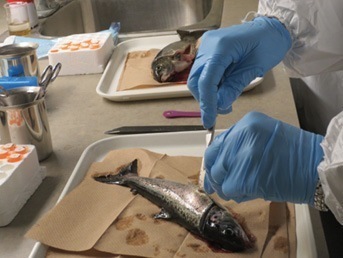 Morton claimed that salmon being transferred into open ocean net pens in British Columbia were not tested for piscine orthoreovirus (PRV) before being transferred. She alleged that infected farmed fish transmitted the virus to wild salmon stocks passing through the area which has resulted in the decline of wild stocks. The Federal Court judge agreed with Morton and gave the DFO four months to include PRV testing in its policy. Under the current policy the DFO did not have to test for PRV. According to the DFO, PRV was initially discovered in Atlantic salmon and subsequently in Pacific salmon and is associated with heart and skeletal muscle inflammation linking it to high mortality rates. The virus first showed up in BC waterways in 2011. PRV has been found in a variety of species of salmonid and non-salmonid fish both in farmed and wild environments.